"My son is only 4-years-old and all he has experienced is pain and embarrassment. His kidneys are not fully developed and his urinary tract was blocked. He was not able to urinate for a long time and when he did, it was only blood. Two holes were put on his stomach and he urinates through that even now. We used to cover it with a cloth. He keeps asking why he is different from others. I tell him he can play and be normal very soon but it looks like that may not happen at all. "- Raghupathy. 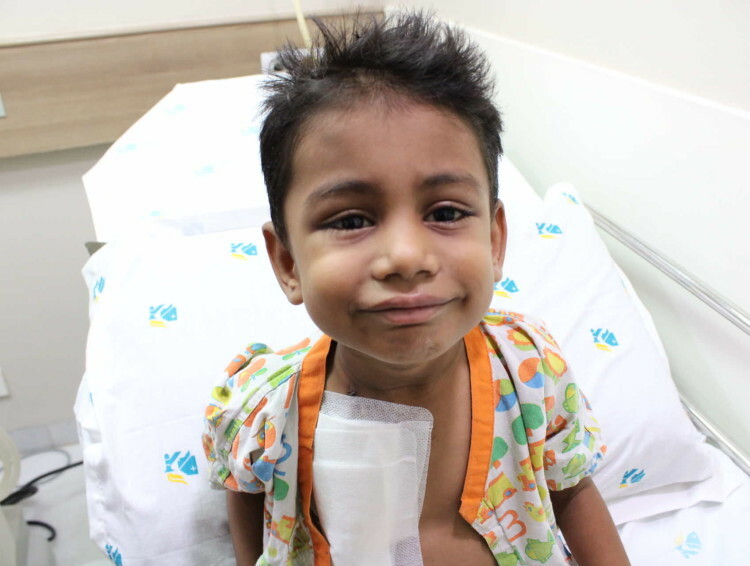 4- year-old Kavinesh has not lost his innocent smile and the charm despite the continuous pain and struggle. But his smile and precious life can be crushed any moment if he doesn't get an urgent kidney transplant. When Kavinesh was born, he did not cry much and looked very pale. Just by looking at him, the doctors knew that something was wrong. They took a scan and found that his kidneys were underdeveloped and it wasn't functioning well. He also had a block in his urinary tract. A surgery was done when he was just 15-days old to remove the block in the tract. He is taking medications since then. He seemed to be fine and grew normal until he turned 2. 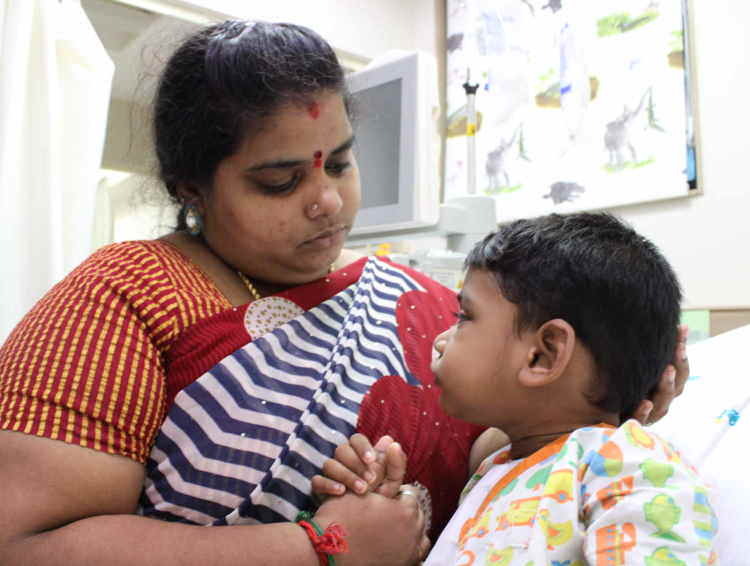 When Kavinesh turned 2, he fell sick and refused to eat. He did not urinate for a week. His parents' nightmares came true when the doctors said that the block in his urinary tract has appeared again. He had to go through another painful surgery just to make sure that he urinates every day. 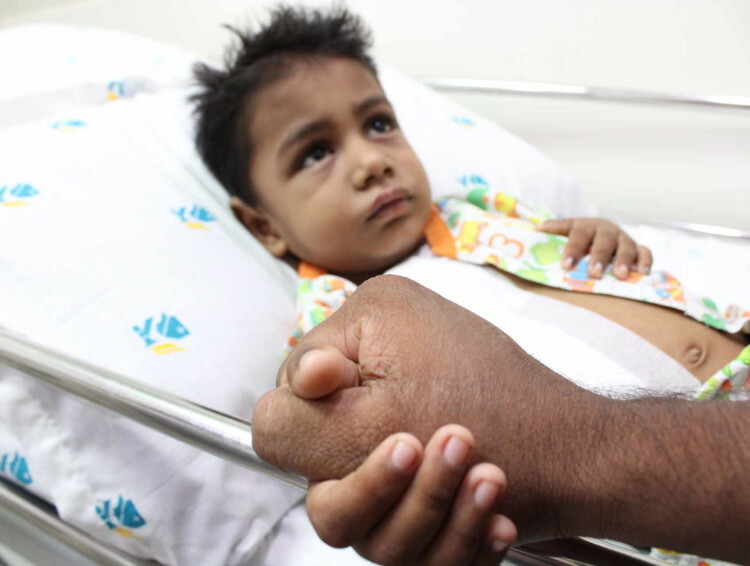 "Kavinesh was not comfortable with the holes in his stomach and tries hiding it when relatives or friends come home. We promised him that we will get it removed before he goes to school with his elder sister. He took all medicines properly, but his condition deteriorated so badly that I could see him slowly slipping away." - Bakkiyalakshmi, Mother. A few days ago, Kavinesh fell sick and his temperature was very high. He couldn't even get up from his bed. His parents were terrified when he started to urinate blood. They were not prepared for another disaster and prayed all the way to the hospital that it shouldn't be anything serious. Their prayers and hope failed. Fate had different plans for this little boy who has hardly lived a normal life. "Doctors said both his kidneys have failed. I stood numb listening to it. I still can't come to terms with it. How much can his little body bear? I have only heard about dialysis but never knew how dreadful it is until I saw my own son going through it. After very dialysis, he gets high fever and cold. He pleads with me not to give him dialysis but how can I tell him that he will not survive without it. Now even that's not enough he needs a kidney transplant to live. " - Raghupathy. Kavinesh needs dialysis thrice a week. He cries for hours uncontrollably. He refuses to come to the hospital but without it, he would struggle to breathe and his body starts to swell. His parents' last hope is the kidney transplant. Only this can put an end to all his pain and trauma. Fortunately, his mother is found to be a matching donor. "We have got a solution for his condition but we are not in a situation to afford it. I have promised him to take him back home soon. He trusts me, he is holding on to me when he is in pain but I fail him every time. Since his birth, I have been spending everything I earn for his treatment, but I don't regret it. All I want is for him to live a happy life. I even sold my house but now I don't have anything left." - Raghupathy. 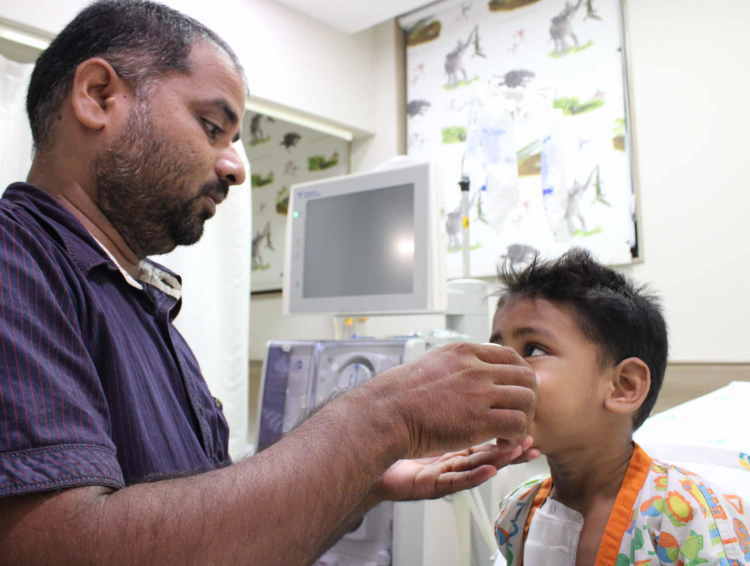 Raghupathy works in a medical shop and earns Rs 10,000 per month. With his meagre income, he had to support his family of four. 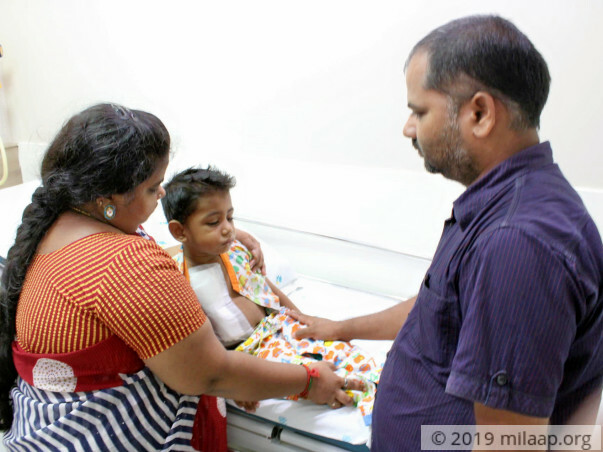 He has spent around 7 lakhs so far for his son Kavinesh's treatment. He has not yet paid his debts. Kavinesh's last chance of survival is the kidney transplant. The family has nothing left to save him. Kavinesh is desperately waiting to return home and live a normal life. Only your support can help him make his dreams come true. 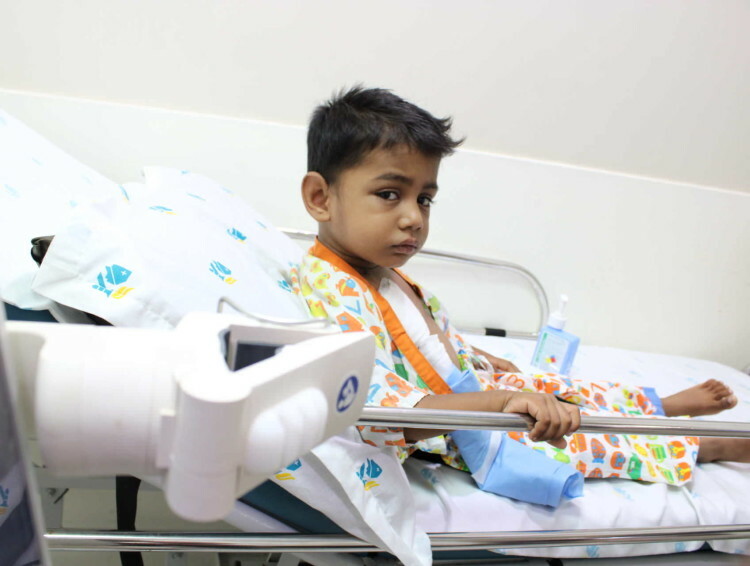 Your kind contribution can save this 4-year-old boy from excruciating pain and recover completely from chronic kidney disease. Thank you for writing in. It means a lot to us. Kavinesh is currently getting better. He weighs 11 kilograms now and needs to gain four more kilograms to be able to undergo the transplant. The mother has been identified as the donor. If everything goes well and there are no complications, the mother is likely to donate. Kavinesh is at home and is on medication is undergoing dialysis twice a week for now. We are all hopeful about his recovery. Please keep praying. Thank you again! Kavinesh is currently doing better. He is undergoing dialysis twice a week and he needs to undergo a transplant at the earliest. The pre-transplant tests indicate the mother to be a potential donor. 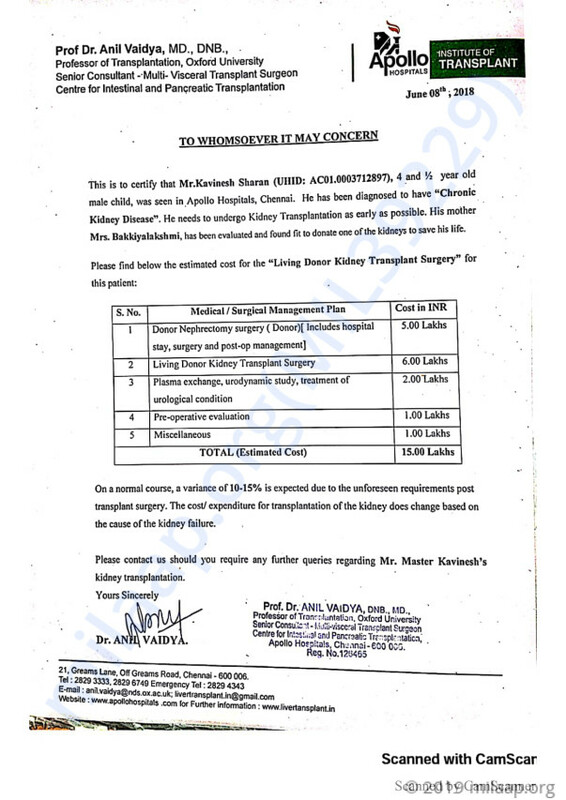 The surgery is yet to be scheduled and once we have enough funds, we shall immediately go ahead with his surgery. We shall keep you posted. Please keep supporting and praying for him.